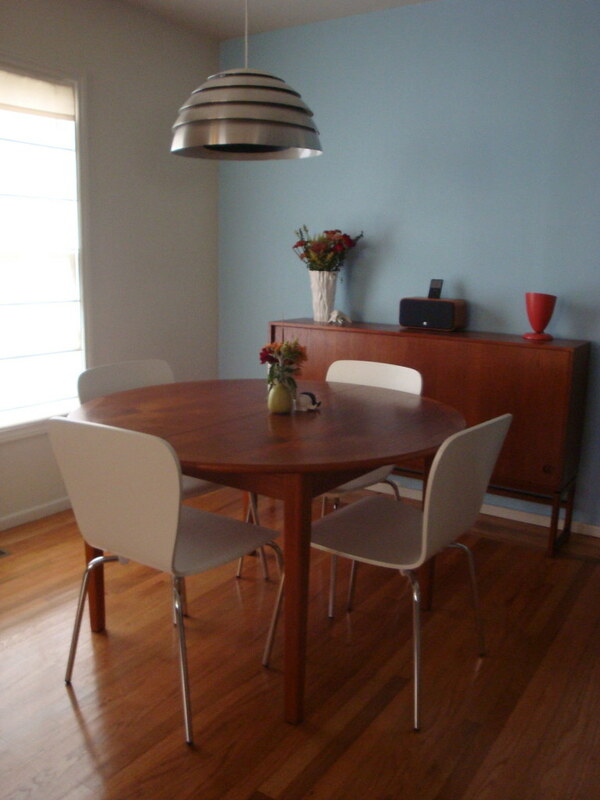 Here we see (back in the corner over there) our original square table from the Alameda flea market. Sadly, it didn’t quite cut it in the new space, what with being too small at its smallest and too big and cornery and hard to navigate when expanded. Also I didn’t love the jumble of dark and light woods going on between the table, credenza, and chairs. I don’t necessarily need everything to matchy-match, but this combo felt a little too “look what we picked up off the street on big trash day!” random. Unfortunately, this table turned out to be a little too little. Marco kind of liked it, but I felt it gave things a depressing “icky, flavored-coffee cafe” feel. Plus it didn’t have a leaf, so we would never be able to serve more than four people…not at one time, at least. And its dark wood-grained top actually exacerbated the wood-WOOD-WoOd problem. 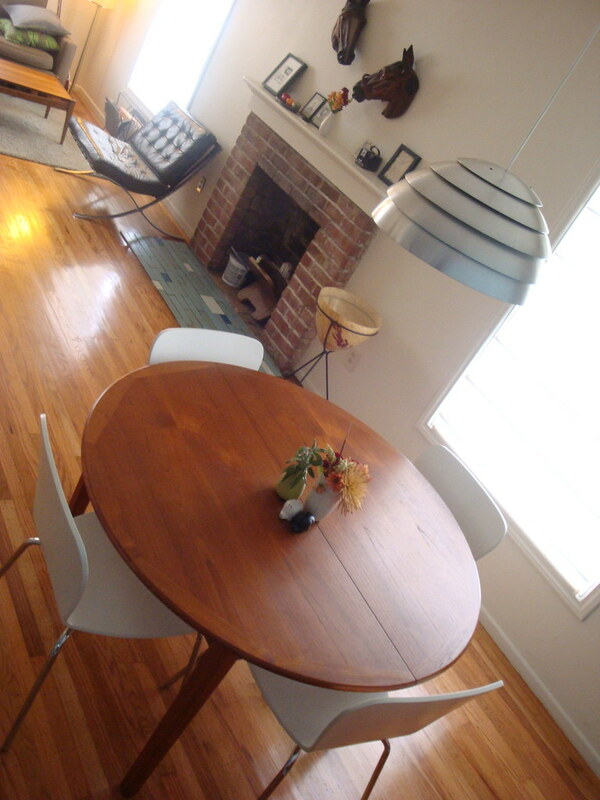 The table is vintage (spotted at Eames Loft by Marco’s friend Janet), and it’s in crazy-beautiful condition, all gleaming and smelling of polish and elbow grease. It comes with a built-in butterfly leaf, which means it’s stored within the table, versus in some tippy, hard-to-get-at corner of the garage. In its leafless state, it’s a good 10” wider than the CB2 table, and just that little added girth really makes it feel proportionate with the space. It was spendy at $440, but the dollars Marco made for selling the other two tables got us almost all the way there. With the table down, all we had left to do was accessorize, which Marco and I just so happen to love to do to, perhaps to the point of unhealthiness? Little green bud vase (with bundle of sage): Heath Ceramics. Taller white carved vase (with cheap-o Safeway flowers): Sara Paloma Pottery. The white chairs are from Crate and Barrel, and I think they provide welcome relief from all the wood. They also tie in the white-white Ikea cupboards found in the adjacent kitchen. Comfy, too! It’s very, very similar to our original piece, only it’s shallower by 7”, which fits the space much, much better. 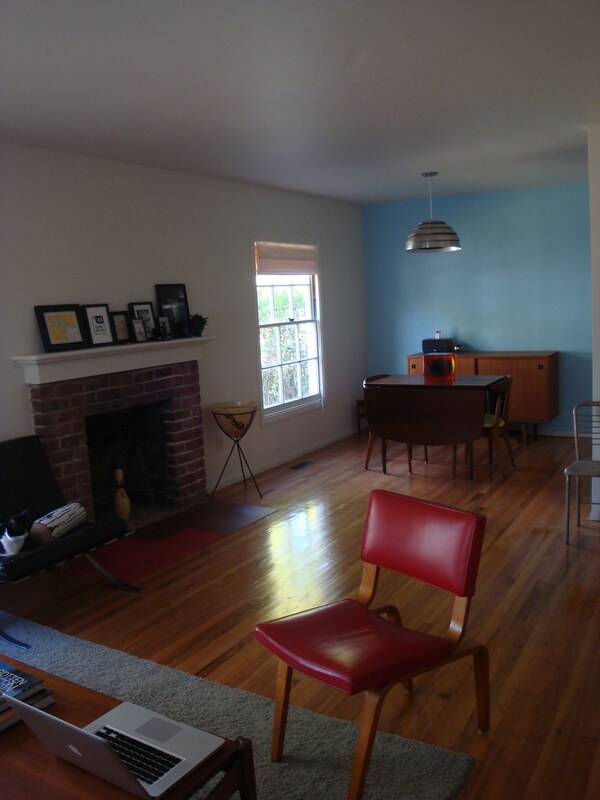 It weirdly was also the same steep $440 as the table, but Marco posted our original credenza on Craigslist and it got picked up as one of Apartment Therapy’s recommended buys for the week, which helped us get a tidy $460 for it. Net: $20! Wooden iPod player: Vers Audio. 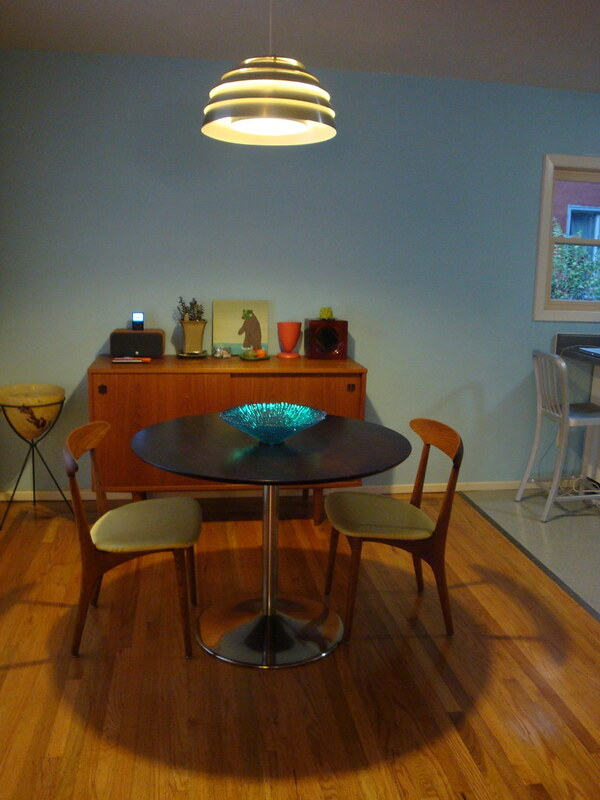 Salmon-hued side lamp: Vintage, discovered by Marco in one of the antique shopies on the main drag in San Anselmo. 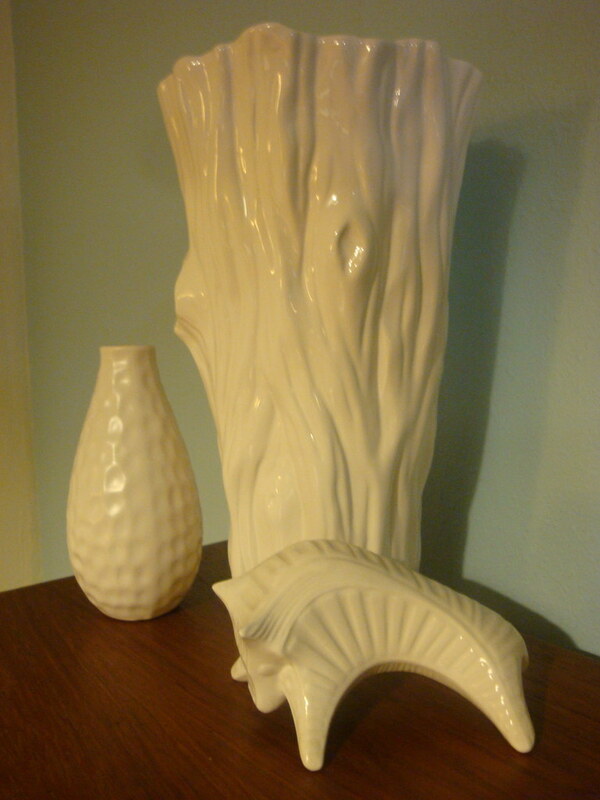 The white faux bois vase was a $3.99 shopportunity from Marshalls. Marco disdainfully says it “looks like celery,” but sometimes Marco is wrong? Little ceramic bull: Jonathan Adler. Bumpy white vase: Ikea. 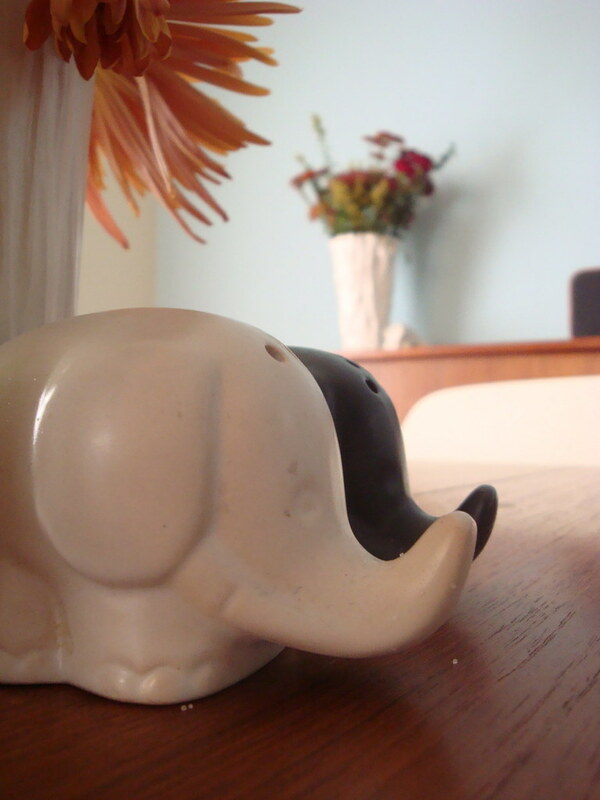 Salty, peppery elephants: Daiso, $1! Next up: Cuting up the Ikea-blank kitchen cabinets! 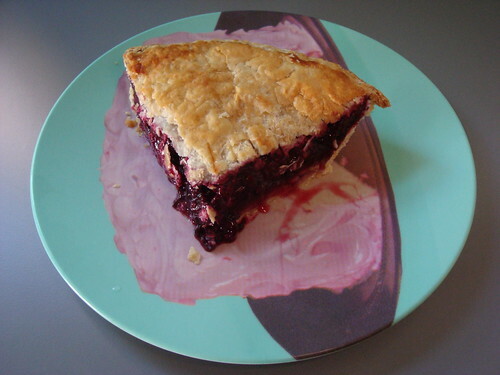 a piece of pie on a cake-festooned plate! That’s one party-sized piece of Fat Apple’s tip-top-notch olallieberry pie (courtesy of the wonderful Adrienne), sitting atop one of my cake plates (courtesy of the inimitable Liz Dunn). Take that, mouth! I am, generally speaking, a gigantically huge fan of eBay. (Some may even say unhealthily so? What with my 96 positive feedbacks, wow?). But the times I love eBay the most are when it allows me to reconnect with items that I’ve fallen hard for elsewhere but never thought I’d be lucky enough to get my own hot, stumpy hands on. I so admired this Deka bird tray when the Thrift Store Addict landed it on one of his miracle St. Paul thrift-a-thons. In truth, I was a even a wee sick-green with the jealous? But thanks to his lovingly detailed description (he’s always so good about listing, if at all possible, the maker behind each of his purchases), I was able to turn to eBay, type in the key details, and there it was! This BCBG Max Azria dress was listed for a very long time at Bluefly for a mean price of over $400. Ridiculous! And yet I was still sorely tempted to Add to Shopping Cart. But before I could give in to the heady lack of oxygen in that sky-high price tag, I took a peek for the dress on eBay, and lo: my second all-time greatest eBay triumph! Ten long years ago, I wandered in to a boutique in LA, one of those crazy high-end places where you have to ring the doorbell before you’re allowed in to even shop inside? And tucked between all the jewels and finery, there it was: The Insane Miniature Aluminum Briefcase. I fell in love on sight and bought it so hard for, I think, a whole $22. And I then proceeded to bring it with me everywhere, from brunch to business meetings, where I would, with much seriousness, whip it out and snap it open like it contained documents of the very highest importance. In fact I whipped and snapped it so frequently that over time the hinges broke off. And then the locks. All the kings horses and men and I tried to glue things back together, but it kept on breaking, and soon I was reduced to the indignity of wrapping rubber bands around the its mini waist, thereby killing the visual awesomeness of it all. Finally, and which much sadness, I put the insane miniature aluminum briefcase out to pasture. But I still spoke of it fondly, pausing over drinks with friends to reminisce over the good times we had with that insane mini aluminum briefcase. And then one day I had the bright idea to search for a replacement on eBay. It took some work to come up with the right combination of search terms (“small, metal, cardcase, snaps, awesome”? “card holder, briefcase, impossibly small”?. And then…Eureka. Isn’t it perfect(ly insane)? Lucky for you, there’s plenty more where that came from. I’ve misplaced many precious things over the years: a perfect pair of 501s (dropped somehow/where between my house and car…who? huh? ); the perfect scoop-necked, puff-sleeved black shirt (stolen from the laundromat, jerks); and, most painful of all, my great-grandmother’s delicate sage green-sparkle costume necklace (left, I think, in the pocket of a shirt I gave to Goodwill, ugh!). You remember these, right? They were a very big deal in the late 70s, or at least they were at my grade school, right up there with googly-eyed puffy vegetable stickers and orthodontics…my best friend and I wanted retainers so badly, we unwound a paperclips and tried to wind them around our front teeth. The barrettes came in the most inspiring array of truly good colors, so it was always very difficult to choose — a young person could spend hours thinking on which ones to invest in…the delicate peachy-orange one, or the deeper, darker, truly orange one? So hard to know! Some girls, in particular the Horsey Girls, would get the whole rainbow and wear their entire collection all at once, right down the side of their heads, which always seemed so fantastically decadent to me. Best of all, these clips were big and strong enough to actually hold my hair, which was and continues to be a beast that few clips have the fortitude to rein in. Maybe, what with the resurgence of high-waisted jeans (look! Dittos! ), one of you time-traveling entrepreneurial geniuses will also re-release these wonderclips into the wild? I hope? And hey, while you’re back there, could you also pick me up some metal-slide Village Lip Lickers balm? Thx.